Genuine OEM HP Ink Cartridge, Tricolor, 360 page yield. Single cartridge contains Cyan, Magenta, and Yellow ink. HP part number: HP 901 Tricolor, CC656AN, CC656AL, CC656AN#140. Remanufactured HP Ink Cartridge, Tricolor 360 page yield. Single cartridge contains Cyan, Magenta, and Yellow ink. 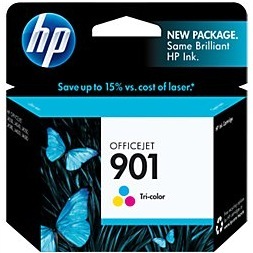 Replaces HP part number: HP 901 Tricolor, CC656AN, CC656AL, CC656AN#140. Remanufactured HP Ink Cartridge, Black 200 page yield. Replaces HP part number: HP 901 Black, CC653AN, CC653AN#140. Remanufactured HP Ink Cartridge, Black, High Capacity 700 page yield. Replaces HP part number: HP 901XL Black, CC654AN, CC654AN#140.